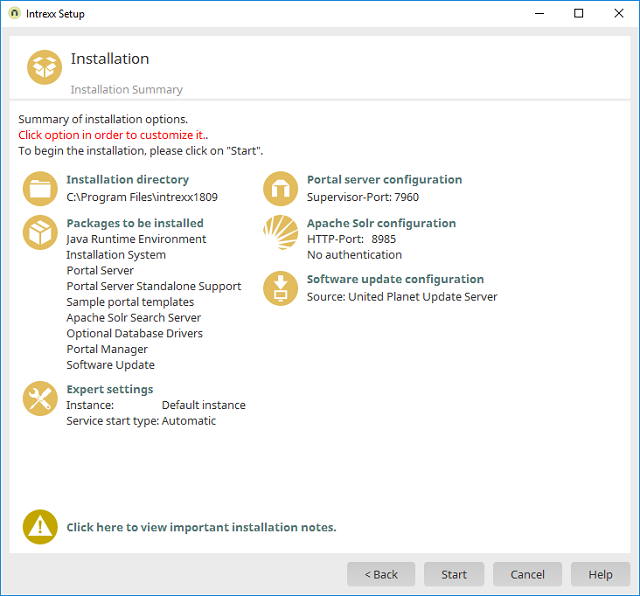 Setup Welcome dialog Installation packages / Click on "Next" Select/enter installtion path / Click on "Finish"
Here you can see the individual components and settings for a Intrexx Portal Server Production Installation (Standalone). Opens a dialog where the installation directory can be modified. Opens a dialog where the desired setup components can be selected. Depending on which packages are selected here, links are shown on the summary page where the settings for the respective component can be modified. If a package is deselected, then the settings link will be hidden in the summary. Opens a dialog where the installation instance can be configured. Opens a dialog where the port of the portal server can be edited. Opens a dialog where the settings for the search server can be edited. Opens a dialog where settings for the online updates for Intrexx can be edited. Opens a dialog where you have the ability to install ImageMagick. Start the installation and opens a dialog where the installation progress is shown.